Ours is a typical manor house of the Reggio countryside. La casa dei Prugni is a farm that uses the technique of permaculture that does not require the use of any chemical fertilizer. All our products are absolutely natural. A quiet place to live a little 'relaxation surrounded by greenery and in the past. During your stay you can use our living rooms all furnished with antique furniture from Emilia. 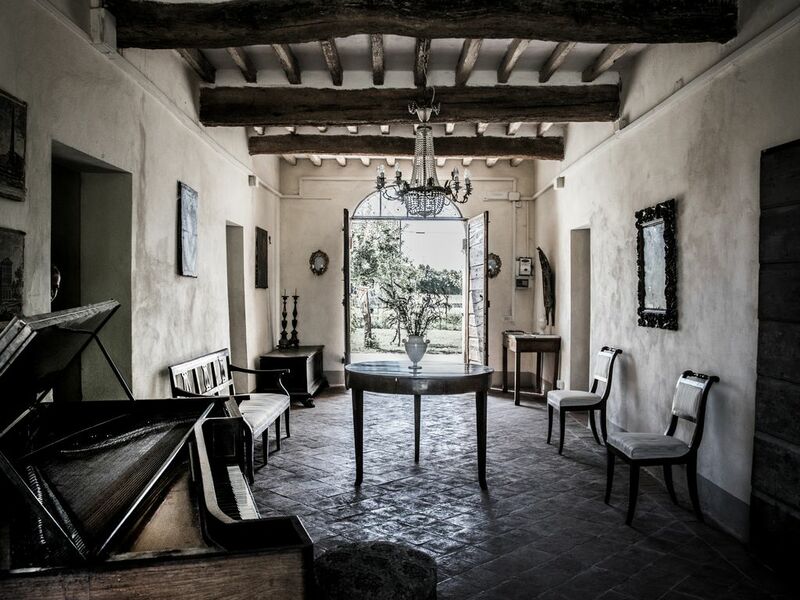 Ours is a country house from the late sixteenth century of the Mantuan type; a large central corridor, open, divides the rooms of the living area facing with the two gates on the gardens to the north and south of the house. In these buildings until the eighteenth century the landowners left the city in June to come to holiday with the family and check all the stages of the harvest of the agricultural estate, which was then stored directly in the granary of the villa. Restored with the desire to maintain the charm of historic homes, and furnished almost exclusively with antiques. The gardens, the orchard and our garden will give all guests the opportunity to spend hours of leisure reading, walking or resting, swinging under the big walnut trees. Even the animals of our guests, welcome, can relax together with the two dogs and the house cat. Guests have access to the whole living area, the large central passage, the living room, the study / library as well as the dining room. From our house you can easily reach Parma, Reggio Emilia, Mantua, Sabbioneta, the Abbey of Polirone. Around Boretto and Brescello it is possible to go trekking on the river Po and discover the flavors of these lands. Just 20 minutes away from the new high-speed station of Reggio Emilia from which to reach Florence in 1 hour, Milan in 34 minutes, Bologna in 20 and Rome in 2.20. Once in a life time opportunity I want to do again and again! Alessandra and Raffaele welcomed my wife and me into their beautifully restored home --and the wonderful experiences soon began. During the days we were expertly directed to the best of Reggio Emilia sights and adventures. But the true value of this stay was to be had in front of the fire in the dining room; the family shared of themselves in a truly remarkable way, food was superb and conversation fun and stimulating -and in English for our benefit. Dogs were "active", which we loved; if that would be a problem I am sure you could asked for them to be put away during your stay. I didn't remember that breakfast would be provided in the posting that I responded to, however it was and it was excellent. Dinner may be requested, on our visit it was the best of seasonal garden offerings and a good value. Any future trip to Italia must include a stay at the "house of plums". Thank you so much for the wonderful words, it is a pleasure to share our home and time with you .... even your Turkish pizza! 😂. we hope there are other opportunities! Such a beautiful home! Built hundreds of years ago and recently restored by Rafael and Alessandra. So many wonderful antiques and a fascinating library of old books that Rafael showed me. And many of the floors and features of the house are original! This is a charming, peaceful, country home in the heart of Reggio-Emilia, with some amazing restaurants just minutes away. Also, the ancient town of Sabbionetta, which Raffael recommended is just a short drive. Rafael and Alessandra were incredible, greeting us with cappuccinos by a blazing fire after we drove through a terrible storm, some wine and local Parmesan with housemade mustarda and green tomato jam. They gave us an excellent restaurant recommendation for dinner. And the next morning we awoke to a homemade breakfast... chestnuts on an open fire, homemade Italian pancakes, scrambled eggs and fresh squeezed blood orange juice and fresh baked pastries. To say that Rafael and Alessandra are hospitable is an understatement. They go above and beyond. I only wish we could have stayed longer! You will not be disappointed if you stay at the House of Plums. A once in a life time experience. A fabulous country/farm experience with an extraordinary family! "House of Plums" graciously accommodated our traveling band of 5 women with spacious room accommodations and an authentic country experience. Raffaele had such patience... helping with directions, answering zillions of questions and even taking us to a weekend country market fair. His beautiful wife Alessandra made scrumptious breakfasts (Raffaele had "latte" duty) while 7 yr old Luca practiced his English. After breakfast we departed to nearby Parma for sightseeing but we always looked forward to returning to the warm hospitality found at "House of Plums". For us it was a real pleasure to host you! Heel gastvrij en fijne b&b! Accueil chaleureux, très attentif et dévoué des hôtes. Belle demeure sur un terrain plus rustique. Wir kamen etwas früher, was aber überhaupt kein Problem war und wurden sehr herzlich von Alessandra und Raffaele empfangen. Das Ambiente ist wunderschön und zwischen den mit viel Liebe ausgesuchten Antiquitäten, haben wir uns sehr wohl gefühlt. Den ersten Abend hat Raffaeles Vater uns sogar zur Pizzeria gefahren. Das Frühstück ließ keine Wünsche offen, alles in allem, sind Sie die perfekten Gastgeber und waren sehr bemüht uns mit Rat und Tat zur Seite zu stehen. Die ganze Familie hat sich sehr wohl gefühlt.